Last week’s Albany budget deal includes $97 million for decommissioning the Sheridan Expressway and transforming it into a surface boulevard. The Sheridan, a short Robert Moses-era highway connecting the Bruckner and Cross-Bronx expressways, cuts South Bronx neighborhoods off from the Bronx River waterfront and its growing network of parks and greenways. Community groups have been advocating for the removal of the Sheridan for almost two decades under the umbrella of the Southern Bronx River Watershed Alliance (SBRWA). The campaign has gone through many ups and downs in the past few years, and there’s still work to do to ensure that New York State DOT moves forward with the project, but with this allocation of state funds the teardown is closer to fruition than ever. In June 2013, the city released a study recommending the transformation of the highway into a surface-level boulevard. The concept reserved more space for the replacement road than SBRWA’s vision had called for, but it still represented a huge improvement over the status quo: narrowing the roadway by nearly 100 feet, creating signalized intersections for walking and biking access to the riverfront, and opening up land for development. The study also recommended new Bruckner Expressway off-ramps to provide trucks direct access to the huge Hunts Point Produce Market. At the time, the cost of transforming the Sheridan was pegged at $45 million and the cost of the ramps $72 million. The City Council endorsed that plan in March 2014, and Bronx Borough President Ruben Diaz, Jr. lent his support in his state of the borough speech last year. But the state DOT had not moved to adopt the plan as its own. Since then, the SBRWA has focused its efforts on the state legislature, working with Assembly Member Marcos Crespo and State Senator Jeff Klein. In 2014 and 2015, the State Senate budget proposal allocated $3 million for an Environmental Impact Study for the project, but the item did not make the final state budget. Now for the first time the state has agreed to fund the project. While some funding for the Sheridan removal has now been secured, the state DOT still has to produce an actual plan. The project was mentioned in a Friday press release from the governor’s office, but a timeline for implementation remains unclear. The press release also announced $159 million for phase one and $129 million for phase two of the rehabilitation of the Bruckner Expressway viaduct, a portion of which advocates hope will go to building the off-ramps that will provide trucks a direct route from the highway to the Hunts Point market. The full cost of those ramps exceeds the allocation in the budget, said Crespo, but $2 million has been set aside specifically to study their feasibility. With these funds, the New York State Department of Transportation will advance the conversion of the Sheridan from concept to reality. This project will be transformative for the residents of the South Bronx, with quality of life being first and foremost. 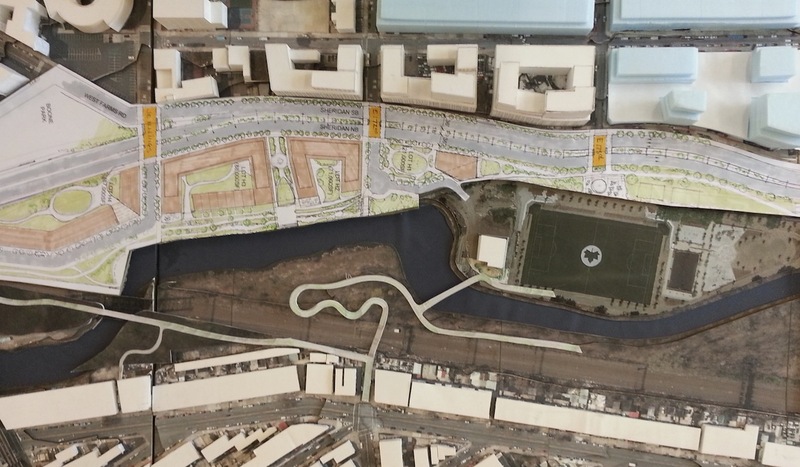 The Sheridan completely disconnects the Bronx River — NYC’s only freshwater river — the South Bronx Greenway, Starlight and Concrete Parks from the surrounding neighborhoods. After conversion, residents and visitors will have easier access to these great amenities, similar to the West Side Highway in lower Manhattan today. Conversion is also an economic development project that will reinvigorate the community with new housing, safer streets, less pollution, more jobs, and new commercial opportunities that benefit businesses and residents alike. The neighborhoods are mostly cut off by Amtrak and the 6 train, and where it is necessary to cross the Sheridan, the 174th Street bridge provides a direct connection at the same elevation as the neighborhoods on both sides (a link that could and should be improved with or without the Sheridan). Honestly, I prefer some of these to surface-running alternatives. The biggest problem is when they put a huge honking road under the highway, completely defeating the point of removing traffic from the surface, and inducing tons of traffic to use the surface street anyway (see: 3rd Ave in Brooklyn and portions of South Street in Manhattan). I’d prefer a transformed South Street with the elevated FDR in place to the alternative, which realistically is going to look like West St/12th Ave. The spaces under the FDR are especially heavily used in inclement weather, when the highway provides shelter. The shelter part makes running a bike lane under a highway a good thing provided it’s protected. Also, it’s far easier to have a bike lane which allows non-stop travel underneath a highway than anywhere else given that the highway is already designed for it. The portion of the Hudson River Greenway that goes under the West Side Highway is very gloomy and unpleasant. It would be nicer if that highway weren’t there. Likewise, the East River shoreline would be a much more inviting place to ride without the FDR blocking out the sunshine. This is a great opportunity for the city of New York. I would prioritize at-grade highways, then below grade (cap em), and finally elevated. The section of the Sheridan which would be converted to a Blvd (north of Westchester Ave) is mostly opposite the river of Amtrak. The 6 train is elevated minus a small area (one block). It would help a lot if they simply finished the construction, and eliminated the weird detours and moonscape pavement. Most freeways removed so far have been elevated – eg Harbor Drive in Portland, Central and Embarcadero Freeways in San Francisco, West Side Hway in New York. In most cases where freeways were replaced by surface roads, the surrounding neighborhoods improved dramatically, evidenced by the fact that property values went way up. Wide surface boulevards do not prevent good urban design, as evidenced by the Champs Elysees and many other streets throughout the world. Elevated freeways do get in the way of good urban design, as evidenced by pretty much every elevated freeway in a city. There are better ways of providing shelter in inclement weather. I’ll argue that suoerhighways have zero justification in any urban area with a density above 20,000/ square mile. There might be a justifiable reason for a superhighway in urban areas with densities between 20,000 and 10,000/mile but these would be rare exceptions. I can see some justification from a commerce standpoint. It’s better for all concerned if delivery vehicles stay off surface streets for most of their run. And with NYC being 20 miles by 20 miles, highways cut travel times substantially over surface streets. I don’t see any justification for highways which allow private automobiles. We shouldn’t be encouraging auto use in the city. We especially shouldn’t be building highways which allow people to commute by car from the suburbs. In an ideal world, yes, NYC would have highways but they would be limited to commercial vehicles, emergency vehicles, and public transit buses. They would also run mostly or entirely underground, thereby avoiding any negative effects on the areas above. It might also make good sense if you build an underground motor vehicle highway to also build a parallel subway and underground bikeway at the same time. Those are what would serve as rapid transit for people. Great news for that area of The Bronx… Especially since their is a lot of development going on right there. 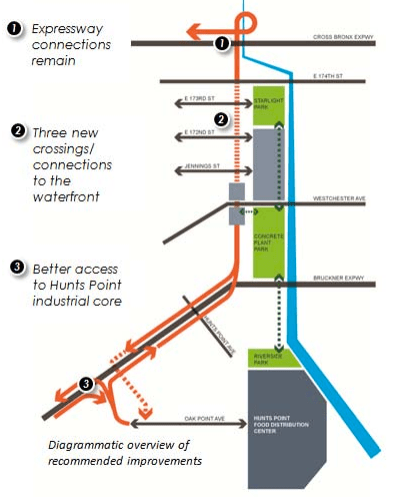 Those ramps off the Bruckner need to be built for sure to keep those trucks out of residential areas – but also allow for better economic efficiency for the businesses at the Hunts Point markets. Wins for everybody. All of this apparently ignores the topography that rises to the west, that would work with a deck *over* the Sheridan between 172 and 173rd Streets, if not further south to Jennings and north to 174th Street, to thus better facilitate local waterfront access. That’s a strange notion given the amount of superbuildings in such urban areas. Too bad so little though is generally given to incorporating such urban super highways in far far better ways. Auto use helps facilitate commerce, so why not encourage it to a degree- make the underground roads tolled to pay for them and to meter the usage. The cost to do so may exceed the monies allocated. I’m more concerned about appropriate traffic calming and adequate loading zones to reduce double parking. The conversion should be limited to two moving lanes in each direction as shown in the rendering. The intersection crossings should be sufficient and red light enforcement cameras should be installed here. I live close by and this is about to become a very active waterfront. The parks are mostly in place and receive consistent usage during warmer days. The new buildings being constructed adjacent are very high density. This is going to be a really great place to live and hang out once completed. There are still pretty substantial gaps in the Bronx River Greenway however. Some have already been accounted for, but others are big question marks. A greenway connection to Soundview Park from Concrete Plant Park, a pedestrian bridge from Soundview Park to Hunts Point Landing, a total overhaul of the Bruckner Blvd drawbridge (hopefully including bus lanes). This is just in the sections below Bronx Park. The Bruckner Expressway however is a big wall dividing several parks. I feel that at-grade highways create the most isolation between either side. I would personally attack those first where feasible. The new ramps to the Hunts Point Market and the fact that this boulevard remains fed at both ends by expressways means it will be far less desirable than a deck atop the existing Sheridan, flanked by new buildings with their ‘1st’ floors facing the level of a new boulevard atop the deck. Also, this could be paid at least in part by the sale of development rights, perhaps with buildings atop the northbound Sheridan lanes. Would like to know more details upon the surrounding area land ownership. reminds me of New Haven, CT, where the authorities sold the Route 34 right of way in plots at $1, yet failed to require the developers to include the required cross supports to preserve the freeway right of way beneath, thus resulting in significantly more traffic upon the service roads. $97 million to rip up a recently reconstructed road-bed rather then a construct a deck for a true local street, in order to increase developer square footage so we can recreate the traffic conditions of south-west bound 177th Street. Lovely. Well I don’t know the exact traffic volume, but from my anecdotal observations as a resident, the Sheridan Expressway sees less traffic per hour than Westchester Ave. This won’t be a very busy blvd, and the addition of ramps in Hunts Point will eliminate a substantial amount of truck traffic. The public has until Wednesday, October 18, to tell the New York State Department of Transportation to alter a plan for new Bruckner Expressway ramps that would cut Hunts Point off from the Bronx River.